Hi there we are looking to adopt a pug in need and my mum has fell in love with Lexi. 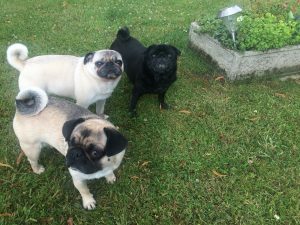 We are experienced pug owners and we would really appreciate a little more information. Thank you Alexandra and Lorraine. Hi, Evelyn, how are you? My name is Pamela and I will contact you to demonstrate my interest in making little Lexi part of my family. We live only me and my fiancé in a very cozy house located in Luton, near the center. With only him working, I would like to dedicate all my time with Lexi, because I always take care of the house and would like a little animal to be part of our family. I was born in Brazil, where I had 7 kittens and 5 puppies in the course of my life, where they were always loved and cared for with all the care and love. I also have a veterinary technician course, can do first aid and always help my little ones at home. I could talk more about my family, and I leave here my great interest in being able to give her all the care and attention.